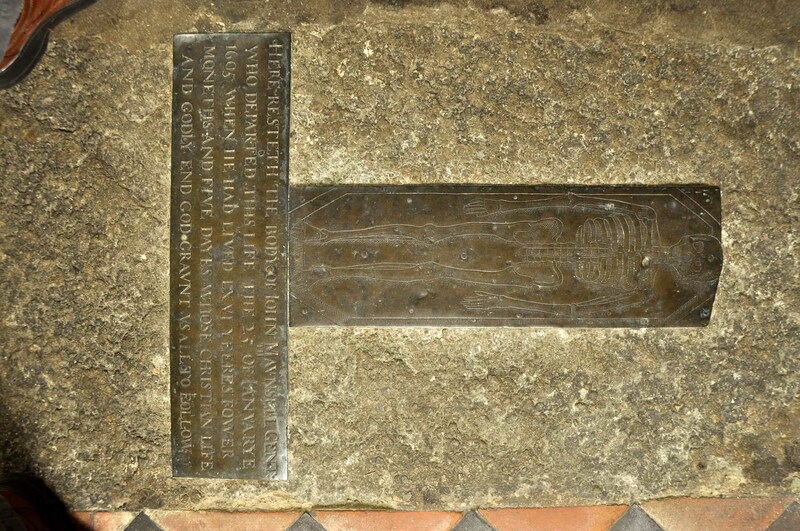 The remains of brass on the stone and evidence of the repair to the brass on the SE Chancel wall suggest that this was probably the location of the original brass memorial to Alice Payn, which was placed close to the Clinton Tomb in accordance with her Will (ref. a). 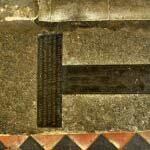 The brass was removed and placed on a wall tablet on the Chancel wall in 1884. ANNO DÑI M°CCCC°XXVIJ CUJUS ANIME PROPICIETUR DEUS AMEN. IN THE YEAR OF OUR LORD M.CCCC.XXVII. MAY THE LORD BE GRACIOUS TO HER SOUL. AMEN. This stone, from which the brass has disappeared, adjoins the John Maunsell slab. 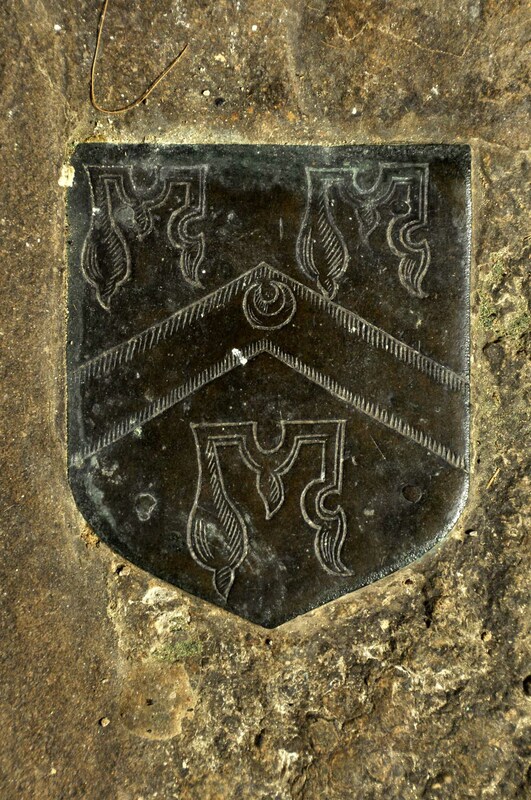 It may have commemorated a member of the Salisbury family, Giles, who was probably the tenant at the Manor House in Haversham before John Maunsell (ref. a). He lived at the time of Henry VIII. 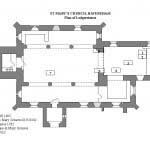 In 1559 the current rector paid an advoweson to the benefice. “Giles Salisbury of Haversham, gent, stood surety for this payment.” (ref. a). Lipscomb describes it as ‘an ancient stone despoiled of its brasses.’ (ref. b). 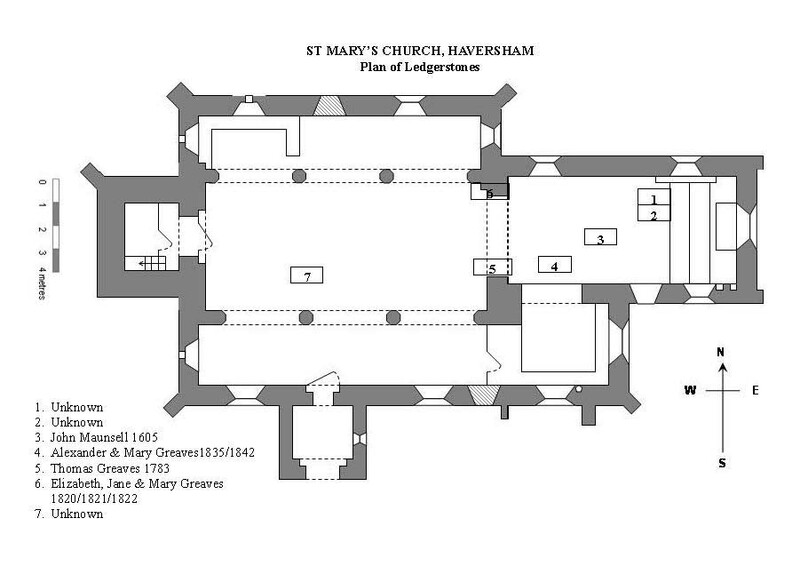 ‘The Story of Haversham and its Historical Associations’. antiquities of the county of Buckingham. … v.4. Brass engraved skeleton in a coffin, in the centre of the top half of the stone. At the top two corners of this stone are the arms of the Maunsell family. Underneath the skeleton is a rectangular plate or plinth with an inscription of five lines of English. 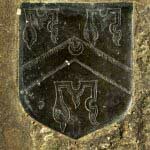 The Maunsell arms show a fesse charged with a mullet between three manches. The right hand edge is mutilated and cemented over. A carpet usually covers the memorial. Alexander Greaves was born on 6 May 1769 and was named after the Squire, Alexander Small, Lord of the Manor of Haversham. It is recorded that he had a sandy complexion, was gentlemanly and kind-hearted (ref. a). He left his estate to his nephew, William Greaves, son of John and Martha Gilks. In 1798 it is recorded that he owned 16 horses, 1 waggon and 3 carts (ref. b). 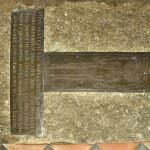 He is buried near the vault in Haversham Church. Mary Harding, his wife, was born in 1768 in Hurstbourne Tarrant near Southampton and they were married on 14th November 1803. There is a wall tablet to their memory in the Chapel behind the organ. Hand-incised ornate freestyle; names in italics. Condition fair. Almost half of the stone is obscured by furniture. The border and corner decorations are partly worn away. The corner decorations could be a stylised leaf or vine decoration. A lot of the inscription has worn away, but it is possible to read parts. Ref. a) Sue Brooker (2013) Greaves Family Tree. The ledgerstone records the three daughters of Thomas and Jane Greaves. Mary was the fifth child and never married. She was baptised on 17th August 1801 and buried on 8th November 1822. (ref. a) The three girls were sisters to Maria Small. aged 28 years of her age, and of Jane who died 29th May 1821 in the 27th year of her age, and of Mary who died 5th November 1825 in the 25th year of her age. Daughters of Thomas and Jane Greaves.